Since its very first shows in February 2016, Hacienda Classical has played more than 40 concerts in the UK and internationally. This year’s summer 2019 concerts for Hacienda Classical will see the show come to new locations as well as revisit some of the venues which helped make its reputation as one of the finest and most energetic of live experiences in recent years. They’ll start out on 8 June 2019 at the largest outdoor arena in the country, Scarborough Open Air Theatre, where 2019’s soundtrack and set will VE performed for the first time. The production then returns to headline the Isle of Wight’s dance tent on 14 June 2019 joining Fatboy Slim, Noel Gallagher’s High Flying Birds, Lily Allen, James, Courteeners and Richard Ashcroft among the acts already revealed for the line-up. Hacienda Classical also takes to the woods with two outdoor concerts as part of Forest Live, the summer live music series of Forestry Commission England at Bedgebury Pinetum in Kent on 15 June and Westonbirt Arboretum in Gloucestershire on 16 June. On 6 July 2019, Hacienda Classical returns the scenes of some of its most legendary nights back at London’s Royal Albert Hall for its fourth event at the prestigious venue. The following week on 13 July 2019 sees their now annual Manchester homecoming Castlefield Bowl event, featuring Inner City live. With a new set for 2019, curated by DJ Graeme Park, Executive Producer Peter Hook and Musical Director Tim Crooks, Hacienda Classical will again include orchestral renditions of much loved classic club records from The Hacienda’s heritage, revisiting some of the tracks that have proved popular with fans as well as bringing new additions and arrangements of seminal tracks to the set. Over its three years so far, Hacienda Classical concerts have brought together a mixed crowd and lively atmosphere at events which see the set played as a continuous live DJ mix where vocalists, choir, orchestra and guests all combine creating a vibrant, exciting performance. 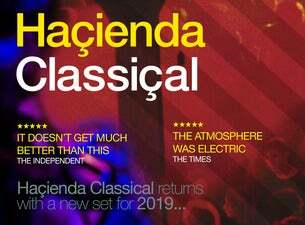 With improvement year on year, 2019’s incarnation of Hacienda Classical promises to be the very best so far.